The family faces a sorrowful time, when they lose Ishita. Raman couldn’t accept Ishita’s death. Adi fails to know about Parmeet’s involvement in the crime. Parmeet fears police can reach him. The police fails to find out the drug injected to Ishita. The lab gets shut for few days. Inspector tries to know about the cause of death. He keeps the syringe, thinking to send the sample for test later. He feels Ishita is dead and there is no use to get the reports in time. Ishita is taken for autopsy. She tries to communicate to the people. She feels the doctors should check the injection bump and find out the real reason behind her state. The police reports that Ishita died by a heart attack. Ishita gets paralyzed because of the drugs. She hears the doctors. Her brain activity runs fine. She feels the doctor’s touch. She thinks that her heart pulse is too low to get noticed. The doctor declares her dead as her heart has failed. Ishita wants to stop them from performing autopsy on her. Her body functioning stops. She wishes the doctors examine her well to know that she is alive. She fears that the autopsy will ruin her body. She prays that someone stops the doctors. Ishita tries her best to move her body. Raman stops them from doing the autopsy. 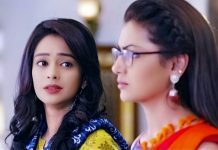 Ishita tries to connect to Raman. She wishes Raman stops the procedure. Raman asks the doctors to wait till Ishita’s parents come and see her once. Raman doesn’t let the doctors hurt Ishita. 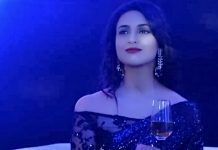 Ishita feels Raman and her relation is very much pure, they don’t need words to communicate. Raman doesn’t remember that he is Ishita’s husband. He tells the doctors that he will meet Ishita. He argues with them to meet Ishita once. Raman meets her and can’t believe she is dead. She wishes he hears her voice and realize she is alive. She is sure that Raman can save her, he would feel a life in her. Raman apologizes to Ishita for all their bitterness. He thanks her for making him realize his duties towards Pihu. Ishita hears his words. Raman requests her to come back to life just once for his sake. Ishita wishes to come back to him. She doesn’t want Raman to leave her. Raman gets away from her. Her hopes begin to fall. Ishita’s body gets secured when her parents doesn’t give consent for autopsy. The family takes Ishita for the final rites, while she shouts out to communicate and stop them. Police gets late to find about the dangerous drugs which stopped Ishita’s body from functioning. Raman will be knowing about Ishita’s paralytic dysfunction and save her in the nick of time.